Obviously this depends on both the coil design and how how they are switched with some approaches producing full saturation in a shorter time, and with a higher energy level, than others. We'll assume that its 1ms long for point of discussion. So, if you want boost and a dizzy, wheres your effective good ignition zone? COP just means you allow the coils to stay totally cool working for 1/4 the time or so. That is why distributors are no good in a high performance application. There are many other reasons such as long leads, caps, rotors, firewall issues with RWD setups. Here is the formula loaded into google calc ready for you to play with for your application. The first post has just been updated slightly to be more clear with some formatting and wording changes etc. Distributor: energy jumps two air gaps, one at low pressure, one at high pressure, energy is lost to both jumps, moisture can cause the energy to be dissipated into wrong places too. Wasted spark: energy jumps two gaps, but one is full of high pressure air, and the other highly ionised exhaust gas. This latter jump is effectively a dead short, so the in-cylinder gap receives almost all of the spark energy. COP/CNP: energy only jumps one gap, all energy is delivered to the plug gap itself, and short of part failure, the spark WILL jump in the cylinder, even if at a sub-optimal time due to insufficient voltage when desired. This is on top of the dwell issues. Note, both wasted and COP/CNP are also much lower maintenance than a distributor. Neither have wear and tear parts (except the plugs) and typically only the leads (and/or carbon rods) themselves degrade slowly with time and heat cycles. A distributor has multiple parts to wear out and fail, even if it's a modern electronic one. This is data from the user "russian" who measured his OEM setup in some way. 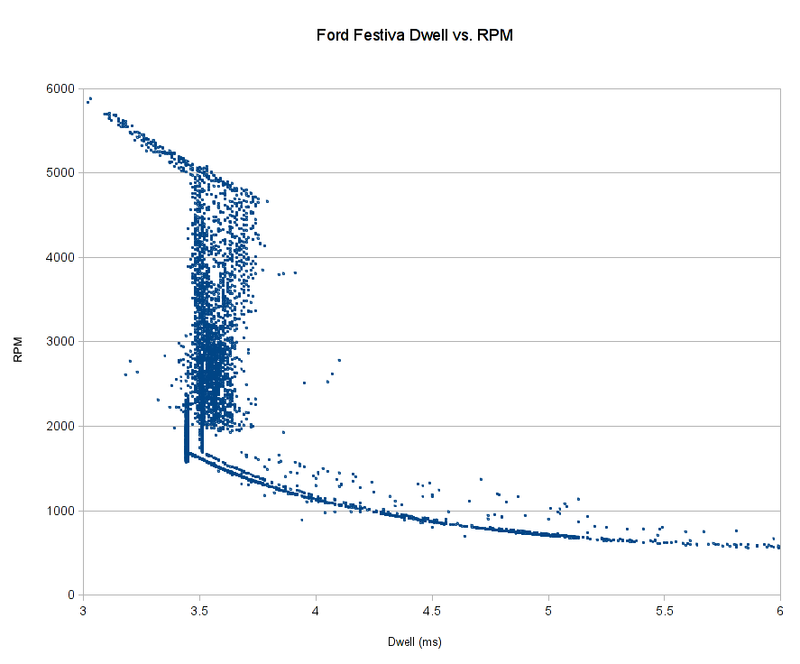 It clearly shows two things, more dwell at low RPM where duty is low, and voltage potentially low, and less dwell at high RPM when it's running out of time. Of which 3ms is dwell and 2ms is available time for the spark to jump. If we use 3ms dwell and 0.5ms spark, then we're good up to a little over 17000 RPM, yes, that's 17k or seventeen thousand RPM. Effectively wasted spark is OK well beyond what most engines can spin to.